In the first post of this series, “Things I wish I would have known- Part 1,” I shared my journey in “ukedom.” I shared how I finally got to the place where I realized the tenor and baritone size ukulele works best for me. On that road I suffered from “UAS- Ukulele Acquisition Syndrome.” The question is why? Why did I buy so many ukes in this last year since I picked up the ukulele? I have bought and sold probably close to 20. I think there are a few factors. These are not excuses, although if you are married your wife may not agree with that statement! First, there are four different size ukuleles: soprano, concert, tenor and baritone. This is not including some of the smaller ones that are available. Each body size has a different feel and sound. Most of that is due to the scale length and body size. Initially, I was in love with the sound of the soprano. Then I was drawn to the super soprano and concert because they had more room on the fingerboard for making chords. I was then drawn to the tenor because of its fuller sound and longer scale. Finally, I got a baritone as I can sing with it better than any of the others. Personally, I think these are all good reasons for trying different size ukes. It may or may not be expensive depending on your income and tastes. Second, ukuleles are as a rule made of wood. There are many woods used for the body and each one has a unique sound. I found myself initially drawn to the spruce/maple combination. In fact I owned three of them in various sizes for a time. Mahogany and koa are popular too. There are also other woods used including myrtle and redwood. The list goes on. On top of that you can also buy ukuleles made by Blackbird that are constructed with Ekoa and Carbon Fibre for the body. Each material used has a different sound. I wanted to experience some of that so I could decide what I really liked. Therefore I ended up spending quite a bit of money to get to my next opinion. During this journey the last year I have spent thousands of dollars on various ukuleles including a Mya Moe Super Soprano and Blackbird Clara. I have also purchased $100 ukes set-up by Hawaii Music Supply that played like butter and got the job done. Here is what I have learned- I don’t have to spend thousands of dollars on one ukulele. If you want to, and many do, I think that is great. The point is you and I don’t have to spend that kind of money so we can have a nice sounding, looking and playing ukulele. Case in point- after selling most of my ukes I was looking for a nice tenor. I spent hours on The Ukulele Site watching the videos as Corey and others demonstrated the ukuleles. I was primarily concerned with volume, balance and tone. You know what I ended up buying? 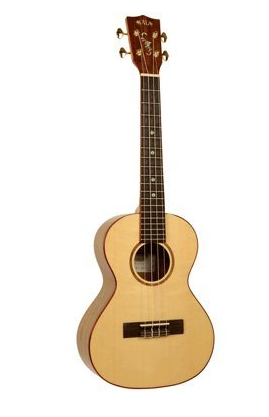 A Kala tenor uke (KA-ASOV-T) constructed with a solid spruce top and solid ovangkol back and sides! I also had them add a K&K Twin Spot pickup. When it arrived I was blown away by its appearance, playability and tone. It sounds great acoustically and plugged in. All of this for a total of $482.99 with a gold strap button installed in the heel, gig bag and shipped two-day priority to my house in Virginia. What I have learned is that I can have 3-4 really nice ukes for what I paid for the Mya Moe. A Mya Moe is a fine instrument, no matter what the size, but for me having all of that money in one instrument didn’t make sense, especially when I didn’t play it that much. On a side note- if you are a musician you will understand this. Sometimes I just don’t bond with an instrument. This is what happened with the Mya Moe. There was nothing wrong with it. It was a fine instrument but we didn’t seem to get along. Ever felt like that? It got sold too! To be fair, I do own more than one ukulele. I am down to the two sizes but I will end up with a few of each size. Some will be acoustic, some will have pickups installed and some will be acoustic electric like my Tenor Godin Multiuke. Each has its own purpose and I play them all. If I don’t play it, and I don’t give it to one of my grandsons, then the instrument will be replaced with something I will use. I am sure all of you can relate to this. This post is not meant to be anything other than me telling my story. There is absolutely no judgment on my part for those who spend tens of thousands on their instruments and own 20-30 ukuleles. More power to you. For me, it doesn’t work. My lesson from this, in hindsight, is I wish I would have known this sooner. I would have saved money and time buying and selling instruments. Should I have owned a soprano uke? Yes. I didn’t need to own 4 at once to figure out it wasn’t my long-term choice of ukulele. The same holds true for the super soprano. Four at once was a little too much. And the list goes on. As they say, hindsight is 20/20. We all learn and grow in life. At least we should. As a musician I know this last year has been a great adventure. It has been educational as well but it sure has been fun. I have met some great people and played some great instruments. I am thankful to the Ukulele Underground Forum for all the help I have received there. Hopefully I have helped a person or two on my journey.